I’m fascinated by the concept of bucket lists. Few things intrigue me more than hearing what other people consider to be must-have life experiences, mostly because the range of “must-have” encompasses so much. I have a general life bucket list (see the Northern Lights; go sky-diving; walk the Camino De Santiago), but I also keep a more specifically bookish bucket list, stocked with book-related experiences I’d like to have during my lifetime – everything from reading specific books to getting more bookish body art to attending conventions. While Katelyn browsed and took photos with Sir Fitzwilliam Waffles, Esq., the store’s dog-in-residence, I got direct Readers’ Advisory help from one of The Ripped Bodice’s owners, Bea, who patiently listened to me explaining what I like in romance (competent characters trying their best; a tinge of sadness in the tone) and what I don’t (banter for banter’s sake; alpha heroes) and then helped me pick out a completely reasonable number of books for purchase. Completely reasonable, and definitely not so many that the cost of said books hit the triple digits and I had to take advantage of the store’s free shipping policy to get them all home. Definitely not. 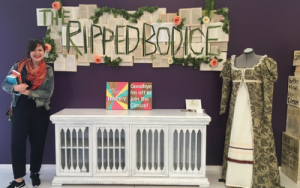 On a generally excellent trip, visiting The Ripped Bodice was a definite high point – not just because it is the most beautiful store in the world, but because it was so wonderful to get to talk about a topic I love with people who share my love of it. I’m pretty sure I teared up at one point. Visiting the Ingalls Homestead in De Smet, South Dakota – I couldn’t tell exactly you how many times I read the Little House series as a kid, but it was at least 15 times all the way through (and many more for my particular favorites). Now that I live a few hours’ drive from South Dakota, I’m low-key planning a trip to the Homestead and other important locations from the books. Read the complete works of James Baldwin: Given that Baldwin’s career as a writer spanned four decades and included novels, plays, essays, short stories, poems, and various other uncategorizable work, this one will be a years-long project. I wrote a thesis on Baldwin, have a tattoo with a quote from one of his novels, and read his work for pleasure, and I’ve made it through maybe 30 percent of his work – which is honestly a generous estimate. If I ever achieve this goal, you will all know because I’ll never shut up about it. 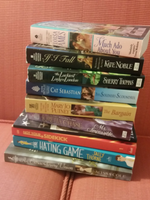 Completing National Novel Writing Month (NaNoWriMo, for short) – I’ve made half-hearted attempts at NaNoWriMo in the past, but I lack the drive to actually finish it. The major problem with this item is that it falls under the extremely broad category of things I want to have done but do not want to actually do. I may never get through all of these, but it’s fun to think about. What about you, readers? 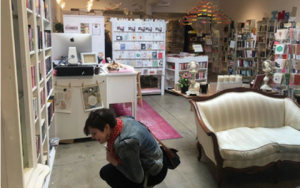 What items are on your bookish bucket list? -Meredith Wiggins is a Readers’ Services Assistant at LPL. Photo Credits: Images of The Ripped Bodice by Katelyn Hancock.